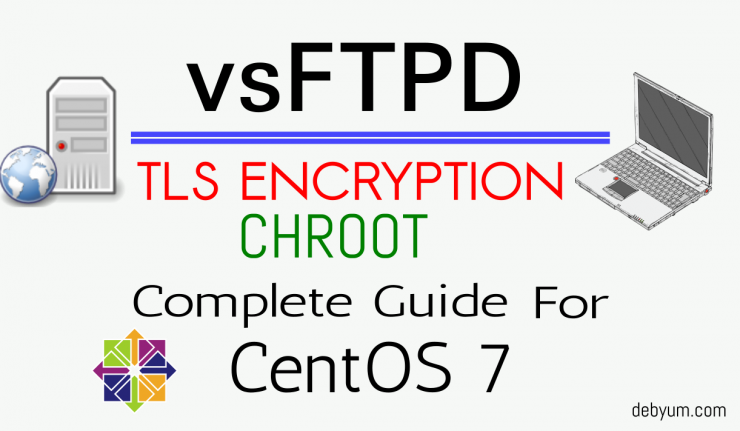 Complete guide to Configure Chroot Jail and TLS in VSFTPD on CentOS 7.
vsFTPD stands for Very Secure File Transport Protocol Daemon and is a fast and secure (if you configure it well) FTP server for Unix/Linux systems. This guide should also work well on RHEL CentOS, Scientific Linux 7 version too. Create a Direcotry and Group for Ftp user’s. Before installing anything we need to create a ftp user first, assign him a directory and a Shell (or not). lets create a Directory for our FTP user or if you want to assign user a already created directory then you can skip this step. Create a new FTP user. Create a new user for FTP and assign him the DIRECTORY, SHELL and then create a password for him. Change the GROUP ownership of the DIRECTORY. Now edit the /etc/shells file and add a fake shell /dev/null to it that will limit the system for FTP users. Next we will edit our /etc/passwd file, find the line for user user1 and replace the /dir/of/ftp with /dir/of/./ftp to divide the /dir/of directory from /ftp directory where the user user1 should be automatically transferred to. This is a must step for every FTP user you want to add to your /etc/passwd file. After this user’s will automatically be placed in /dir/of/ftp directory as their root directory. They wont be able to move up the file system. Now that we have a USER, GROUP and a DIRECTORY, let’s install the vsftpd package. Now we can start editing our vsFTPD config file but its always a good practice to take backup of any config file before editing it. After the backup now we can start editing the config file with text editor of your choice. I am using VIM to edit files here, you’re free to use any editor you like. we will make couple of changes within this configuration file. First we will find this line anonymous_enable=YES and replace it with anonymous_enable=NO . This is the first step in ensuring security. Now lets configure vsftpd to be able to chroot (also known as jailing) users to their home directories or other directories. Its necessary for security (and privacy). When user’s are in chroot, they can’t move up a level in the directory structure. You can chroot a user in vsftpd by editing following in config file. Now lets create that file and you can leave this file blank if you don’t want to specify any user now. Next we need to take care of listen directives. Normal ftp connections are not encrypted which is not secure at all and should be avoided whenever possible. Encrypted connections are the need of hour. we will be using TLS instead of SSL ( TLS is more SECURE ). First things first, we need certificates to use with our encrypted connections and a directory to store them. so lets create a directory to store our certificates. Now we will make necessary changes within vsftpd.conf to configure the secure connection. Add TLS info at the end of the file. Next, we need enable the use of these files and disable anonymous users. We should also force the use of SSL for both data transfer and login routines. This will make the security mandatory. For extra security we will make it mandatory to use TLS for Logins and data transfer. Add this to end of file. Add the following to the end of the file if not already present in file. passive mode connects to any random port > 1023, what we are doing here is defining a fixed port range for VSFTP to use for PASV connections and then will allow these in our firewall rules. Start service and firewall configuration. NOW make changes in firewall configuration. Allow ftp service through FIREWALL. LAST BUT NOT LEAST CONFIGURE SELINUX. configure SELinux to allow ftp access to the users home directories. Here’s sample config file just to make things simple. Now your vsftpd server is ready and running. I have tried to cover all the basic to advance concepts with their examples. Still if I have missed anything please update us through comment box. I will keep updating the same based on feedback’s received.??? ?